Sherwani appears at the obverse left of the note. "STATE BANK OF PAKISTAN", the denomination, the promissory clause and the guarantee clause appear in Urdu in the centre. The signature of the Governor, State Bank of Pakistan, Yaseen Anwar is printed at the obverse in main colour of the note (Green) above the words ‘GOVERNOR STATE BANK OF PAKISTAN’. Embedded security thread into the paper runs from top to bottom at the obverse left of the note. Words ‘State Bank of Pakistan’ and denomination ‘10’ can be seen in embedded thread. Security thread appears fluorescent yellow when the note is viewed under ultra-violet light. The denomination appears in Urdu numeral on right and left top while the denomination in English appears on right bottom & back image in the lettering. The note has been printed by offset Process in multi-colours. The words ‘STATE BANK OF PAKISTAN’, the denomination, the promissory clause, the guarantee clause, appear in Urdu at the centre of the note. The words ‘GOVERNOR STATE BANK OF PAKISTAN’ in Urdu appear at the centre of the note. 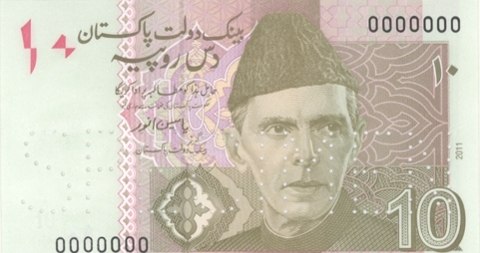 Micro lettering denomination numeral ‘10’ appears at the right top close to the printed picture of Quaid and at the left bottom close to the security thread of the note. The back of the note has been printed by Offset Process in multi-colours. Vignette of Khyber Pass, Peshawar, alongwith the name appear on the note. The words “ “ appear in a round design at the back upper left of the note..
Micro lettering denomination numeral 10 appears at the left along side geomatrical patterens. The seal of the ‘State Bank of Pakistan’ appears at the left bottom of the note.